From the start, Star Traders RPG has been a game I like to play. 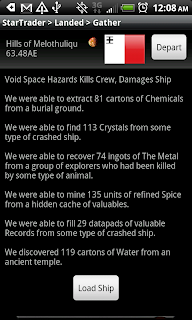 As the developer, I have played a lot of Star Traders. The game's internal calculation system uses a difficulty scale for nearly every check -- shooting, landing, trading and repairing. The Star Traders RPG game difficulty system uses a scale heavily weighted by the game length. The game setting "Game Difficulty" is a multiplier that is applied after game length and map area. Star Traders RPG is a story of a space Captain wandering the galaxy among the ruins of a fallen civilization -- as the years pass, the ships get more deadly, the resources scarcer and the prices go up. Therefore, the Star Traders RPG difficulty system functions like a clock. The clock is always working against the Captain and his skills. The number of turns used in the game directly determines how difficult the game will be. For example, the test to explore a planet 4 years (208 turns) into the game is much easier than it is to explore that same planet 20 years (1040 turns) into the same game. After 130 years (6760 turns) the game has become incredibly difficult. The Captain's skills and ship must be continuously advanced to keep up. At any point in the game the Captain is either ahead or behind the difficulty clock. The Captain can catch back up, but it isn't easy. Therefore, the enemy captains the player will face are sometimes above, sometimes below and sometimes equal to the captain. The distribution and difference between the player and the enemy is controlled by Game Difficulty setting and the difficulty clock.